As with installing your own solar energy, installing wind energy will help to reduce carbon emissions, which damage the environment and will save money. The U.K. is ideally placed to generate wind energy, with the potential to have 40% of Europe's total wind energy situated here. Wind power is an efficient way of generating electricity, and is - like solar power - entirely renewable. It's only downfall is possibly the visual impact it makes on the landscape: A tall 'small scale' generator could attract wide rebuttal from neighbours, and this is worth considering before embarking on a wind generation project. However, if you live in a remote area, which benefits from exposure to the wind, or have neighbours that are happy for you to go ahead with the project, installing wind power can be an economically viable way to capitalise on natural, renewable resources. The British Wind Energy Association (BWEA) is a professional body that supplies a range of useful information and services to help wind related energy initiatives get off the ground. BWEA run a number of initiatives to promote the proliferation of wind energy both on a national and domestic scale and hold information about a number of domestic wind system suppliers, planning permission and grants. The government backed 'Energy Saving Trust' are committed to provide advice on a wide range of issues to individuals and companies wishing to set up small scale wind generators. A wind generator will cost in the region of £3'000 - £15'000, at about £3'000 per kilowatt. This compares well with solar, is marginally cheaper in comparison to its higher output, and will, in all likelihood, return a greater yield of energy year on year. You can expect a wind generator to pay for itself in little over five years, and with conventional energy prices soaring, the dividends will increase with time. 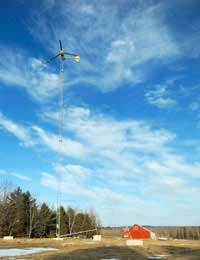 The turbine should be placed high up, to maximise the strength of the wind and in a clearing, free from obstructions. To maximise potential it is necessary to gauge the strength of the wind in your area, in order to face the turbine in the direction of the prevailing wind. You can gauge wind speed by buying or hiring an 'anemometer', although any installation expert will be able to do this for you. Small sale wind generators can either be connected to a battery, that can then be used to run your electricity supply, or connected to the national grid. Which you choose to operate will depend on your situation. Essentially the difference is minor, only affecting where your energy is directed. If you live in a remote location which does not have access to the national grid you will need to have energy directed to a battery, which can, in turn be connected to your mains supply. If you do have access to the national grid you can have your generator connected directly to the grid. This will enable you to not only benefit from energy savings as a result of not having to use electricity from the national grid, but also to sell electricity to the national grid when you have an abundant supply.